After decades of strong gains, the share of women in the U.S. labor force has plateaued in recent years. 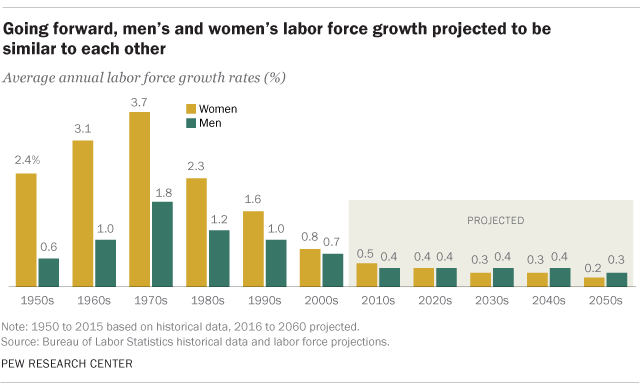 Recently released projections from the Bureau of Labor Statistics indicate that the female share of the labor force will peak at 47.1% in 2025 and then taper off to 46.3% by 2060, meaning that women will remain a minority of the labor force. This overall trend in the composition of the labor force is tied to labor force participation, which the new projections indicate will continue to decline for both women and men. Most economists say a decline in labor force participation is a matter of concern because improvements in the nation’s standard of living depend on labor force participation and productivity growth. The rapid increase in the share of women entering the labor force between 1950 and 2000 boosted overall labor force participation and spurred an increase in living standards (as measured by gross domestic product per person). The decline in participation since 2000 has worked to the opposite effect, depressing economic growth. From 1950 to 2000, women’s labor force participation had increased rapidly (particularly among married women and married mothers), while men’s participation declined. For example, during the 1960s the female labor force grew, on average, three times faster than the male labor force – 3.1% per year versus 1.0% per year. By 2000, 59.9% of women were in the labor force, up from 37.7% in 1960. This rapid growth boosted women’s representation in the work force overall. The decline in female labor force participation since 1999 is not solely due to aging and retirement. The participation rate of women ages 25 to 54 has fallen since 2000. The drop has been widespread. Mothers with children younger than 18 are less likely to participate in the labor force now than they were in 2000, particularly less-educated mothers. Some researchers have suggested this may be due in part to changing gender role attitudes. Women without children under 18 and single women are also less likely to participate than they were in the 1990s. The withdrawal of single women from the labor force in part reflects that more of them are going to school. Looking forward, the BLS projections assume labor force participation will continue to decline for both men and women at similar rates. The result is that both labor forces are expected to grow by 0.5% or less per year. Of course, future labor force participation rates are not etched in stone. They are influenced by wider societal trends (such as marital stability and childbearing), wage growth, and policy changes such as tax policy and family leave policies. But if the much more modest growth rates of the labor force that BLS is projecting do hold true, the U.S. will face some headwinds in stoking economic growth in the future.